Everyone and their life coach has released a 6" ereader, but 8" models are still the rarer than hen's teeth. I have two different large screen ereaders sitting on my desk right now, and while they have the same screen size and share certain design elements, they could not be more different. The Inkpad was released late last year by Pocketbook, runs Linux, is little more than an ereader, and is still hard to find,; while the Onyx Boox HDML Plus has been out for just over a month, runs Android, and thus offers the possibility of doing more than just displaying ebooks. The i86 and the InkPad use the same 8" Pearl E-ink screen and they have similar lopsided designs, but that is about all they have in common. The i86 has a black shell with page turn buttons to the left of the screen and a back button below the screen. Its power button, microSD card slot, microUSB port, and headphone jack are on the lower edge. It has a rubberized rear with a slight curve on the rear edges. As I explained in my review of the InkPad, it has a brown plastic rear shell with a black front. Its page turn buttons are to the right of the screen under a rubber strip. The rear shell has rounded edges and a rubber pad which makes it easier for me to grip the InkPad. Of the two designs, I'd say the InkPad is prettier for the subtle details. The rubber pads make for a more pleasant feel, and the frontlight is controlled by a swipe bar over the screen. Speaking of the frontlight, the one on the InkPad is simply better. It's brighter, whiter, and offers finer control. The frontlight on the i86 is splotchy to the point of being ugly. With the frontlight off, the i86's screen (with an IR touchscreen) is slightly more gray/brown than the screen on the InkPad (which has a capacitive touchscreen). I know that sounds contradictory but it is true. In terms of battery life, the InkPad lasted a week and the i86 lasted a couple weeks. The InkPad runs a proprietary version of Linux, while the i86 runs Android 4.0 and comes with Google Play. In other words, the Inkpad is limited to what it can do out of the box, while with the i86 you have the option of installing apps. The InkPad does have a few apps of its own, including a web browser, calculator, games, and Dropbox (more details here). But the i86 has Google Play, and enogh space for 14 apps (after that you'll need to uses the settings menu to move the apps to another part of the internal storage). Out of the box, both devices support the same basic range of ebook formats, although the InkPad does also have limited support for office doc formats (more details here). The i86 supports more annotation and formatting options, and they are much easier to access, but on the other hand the i86 does not have a readily accessible TOC in the stock reading app. That's really beginning to bug me. They both offer font sizes which range from ones too small for me to read to 72 pt font and beyond, and while they don't offer the exact same font sizes I did note that both offered specific numbered font sizes. 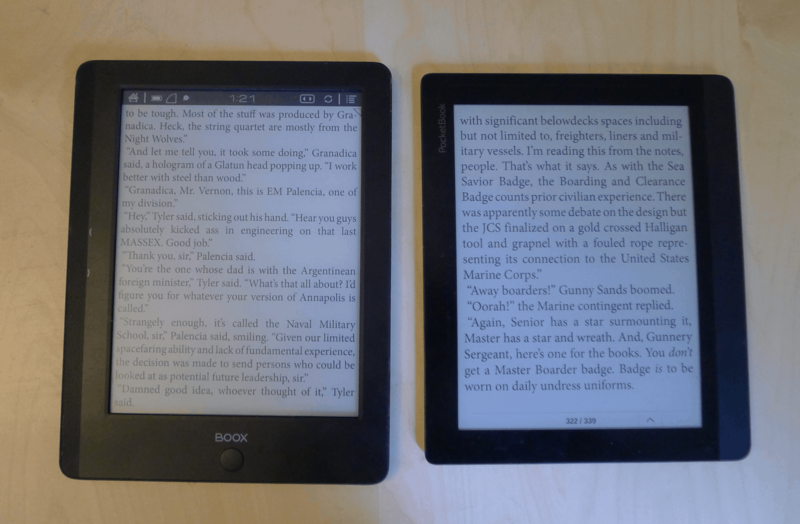 The second photo below shows both ereaders with the font size set to 60. Both devices can read an ebook to you. The Inkpad sounds pretty good, but the i86 uses the stock Android TTS and sounds terrible (but you can fix that by installing an app). In terms of page turn speed, the i86 is noticeably faster in the stock app than the InkPad, and still somewhat faster in the 3rd-party apps. Now that I've had the i86ML for a month, I find myself growing increasingly dissatisfied with it. It is in many ways a better device than the InkPad, but as an ereader I just don't care for it. The i86 is a little faster at turning the page and I can install more apps, it also has a key shortcoming. The frontlight is crap. It might sound silly to hang a review on such a minor component but I've really come to value how a frontlight impacts my reading. And for that reason I like the InkPad over the i86. i wanted to ask if the inkpad supports pocket,instapaper or any similar app. and if it does, have you used it? does it run properly? i read this article and your old review but couldnt find any info on that. It does not support either of those services, sorry. This isn’t exactly what you are asking for, but the InkPad does support emailing ebooks to the device. The service is called Send-to-Pocketbook. If you can find a way to email an article as an ebook, you can deliver it to the InkPad. Why are they still using Pearl screens when the carta screen was released 2 years ago? Technology development in the e-reader market is so slow it is ridiculous. Every new e-reader seems to offer hardly anything better than what was released years ago. Because this one was never updated to Carta. The 8″ screen was originally developed for the color E-ink screen, and then someone had the bright idea of taking the color filter off and using the screen in grayscale mode. No one seems to be interested in paying to develop an 8″ Carta screen, alas. On one hand, it makes me really glad I got the pocketbook inkpad. On the other hand I expected more from the onix reader. The pocketbook is my first reader with an frontlight, as I’ve only previously owned a Nook Classic. Still I am disappointed with the frontlight because I can clearly see the leds on the side, especially when moving into landscape and I think that the lighting is even enough only when you crank it way up, otherwise you can clearly see the led lighting. As such I thinking that other readers have better lighting but from what I can see from your pictures what I have can be considered good :). Regarding the availability of the pocketbook I got it in a week from https://www.alzashop.com/pocketbook-840-inkpad-dark-brown-d2143641.htm which will ship to Europe, and the price will go down by 5E if you sign up for their newsletter. A shame they only ship to Europe as I thought that they shipped worldwide. Still in Europe this is a great price ( the best that I could find actually ) with a small enough amount as the shipment cost (10E). Was looking forward to receive the new firmware as I am still on the stock 5.4 ( which I am happy with as I can use Koreader and I don’t mind the epub back issue ). Either way thank you for the comparison, now I am really glad I took the plunge and got the Inkpad instead of paying an extra 60E for the Onyx reader. Thanks! And yes, I did buy the i86 from that site. And is Pocketbook still planning to release a firmware? It’s been so long that I had assumed they had given up. http://allesebook.de/forum/showthread.php/4108-PocketBook-InkPad-Fragen-und-Antworten/page8 if you tell it to translate from german Forkosigan user is a pocketbook empoyee. InkPad update to version 5.7 has been added to plan, provisional appointment, which but not 100% could be guaranteed would be the end of June-early July (2015). I check this thread and the mobilforum daily but it seems that the date has slipped again from July to September if I am to trust what the user from the mobileread forum said. It’s been so many delays I just hope they will finally ship it and not abandon it altogether. The InkPad really needs that update, so I hope they do follow through. Thanks for letting me know. I’ll keep an eye out. Will the Onyx double as a second monitor? With the right Android app, maybe. This is a trick that has been possible ever since the original Nook. thanks for comparison and review of i86ML. In some points I disagree with your reported weaknesses of Onyx device, though. 1. I also had InkPad in my hands and was able to compare them. Contrast of my sample Onyx I86HDML was clearly better than that of Inkpad. Since both screens are products of EINK but the screen of Pocketbook got additional capacitive layer it was to expect. 2. Concerning front light – most of our users forced us to make it dimmable to the lowest possible level. Nobody liked too bright front light of T68. We did what has been demanded. In my opinion it is very comfortable to read now in dark surrounding and also saves battery. 3. Concerning access to TOC – I just checked it again. When a document has got this Table of content, it shall work just fine in our applications too. Please check the software version of your device. I received my i86 a few days ago and I don’t see why you thing that the front light is crap. It is my first e-reader with a front light, but I can’t see any issues with it. The screen is evenly lit. I’m using the light at about 70% setting. The only thing I didn’t like so far is the lack of a proper dictionary, I’ll have to look for one to add to it when I figure out how to do it. Thanks for the review! Really helped me in making a decision.